Maureen Kathleen Stewart Forrester, CC OQ (July 25, 1930 – June 16, 2010) was a Canadian operatic contralto. Maureen Forrester was born and grew up in Montreal, Quebec, one of four children of Thomas Forrester, a Scottish cabinetmaker, and his Irish-born wife, the former May Arnold. She sang in church and radio choirs. At age 13, she dropped out of school to help support the family, working as a secretary at Bell Telephone. When her brother came home from the war he persuaded her to take singing lessons. She paid for voice lessons with Sally Martin, Frank Rowe, and baritone Bernard Diamant. She gave her debut recital at the local YWCA in 1953. She made her concert debut in Beethoven's Ninth Symphony with the Montreal Symphony Orchestra under Otto Klemperer. She toured extensively in Canada and Europe with Jeunesses Musicales. She made her New York City debut in Town Hall in 1956. Bruno Walter invited her to sing for him; he was looking for the right contralto for a performance and recording of the Mahler Symphony No. 2 "Resurrection". This was the start of a warm relationship with great rapport. Walter had been a student of Mahler, and he trained Forrester in interpretation of his works. She performed at Walter's farewell performances with the New York Philharmonic in 1957. In 1957, she married the Toronto violinist and conductor Eugene Kash. The couple had five children, including actors Linda Kash and Daniel Kash. Forrester converted to Judaism. She performed regularly in concert and opera. At the New York City Opera, she sang Cornelia in Handel's Giulio Cesare (1966), opposite Norman Treigle and Beverly Sills, which was recorded by RCA in 1967. She sang at the Metropolitan Opera in New York in 1975 in Das Rheingold (Erda), Siegfried, and Un ballo in maschera. Forrester also provided the voice of the Bianca Castafiore character in the television series The Adventures of Tintin. She was a strong champion of Canadian composers, regularly scheduling their works in her programs, especially when she toured abroad. A notable example is composer Donald Steven, whose work "Pages of Solitary Delights" (winner of the 1987 Juno Award for Classical Composition of the Year) was written for Ms. Forrester. From 1983-88 she served as Chair of the Canada Council. In 1986, she co-authored her autobiography, Out of Character (ISBN 0-7710-3228-5), with journalist Marci McDonald. Maureen Forrester died on June 16, 2010, aged 79, in Toronto, after a long battle with dementia. She was predeceased by Eugene Kash, her former husband, whom she had divorced in 1974, and who died in 2004. She was survived by her five children. In 1967, Forrester was made a Companion of the Order of Canada. In 1969, Forrester received an honorary doctorate from Sir George Williams University, one of Concordia University's founding institutions. In 1979, Forrester received the Loyola Medal from Concordia University. In 1983, Forrester was awarded Yale University's Sanford Medal. From 1986-90, Maureen Forrester was Chancellor of Wilfrid Laurier University; the University's recital hall is named in her honour. In 1990, Forrester was inducted into the Canadian Music Hall of Fame (aka Juno Hall of Fame). In 1995, Forrester received a Governor General's Performing Arts Award. 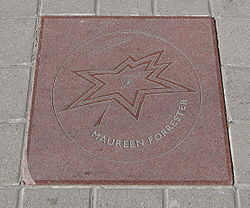 In 2000, Forrester received a star on Canada's Walk of Fame. In 2003, Forrester was made an Officer of the National Order of Quebec. In 2004, Forrester became a MasterWorks honouree by the Audio-Visual Preservation Trust of Canada. ^ Obituary for Forrester Archived 2012-01-21 at the Wayback Machine, theglobeandmail.com; accessed June 23, 2015. ^ Downes, Edward (13 November 1956). "MISS FORRESTER IN DEBUT RECITAL; Canadian Contralto Displays Superb Voice--Poulenc and Britten Works Included". New York Times. Retrieved 20 March 2018. ^ Taubman, Howard (15 February 1957). "Music: Mahler's Second; Symphony Is Directed by Bruno Walter". New York Times. Retrieved 20 March 2018. ^ Conversion to Judaism, jam.canoe.ca, June 17, 2010; accessed June 22, 2015. ^ Peyser, Joan (25 September 1966). "She Waited for the Right Moment". New York Times. Retrieved 20 March 2018. ^ Henaham, Donal (11 February 1975). "Opera: 'Das Rheingold,' Back at Met, in Near Magical Program". New York Times. Retrieved 20 March 2018. ^ a b c Brian Kellow. "Beloved contralto Maureen Forrester dies". Opera News. Retrieved June 23, 2015. ^ Profile Archived 2010-03-07 at the Wayback Machine, CanadaCouncil.ca; accessed June 23, 2015. ^ Profile, thecanadianencyclopedia.com; accessed August 28, 2015. ^ "Honorary Degree Citation - Maureen Katherine Stewart Forrester* | Concordia University Archives". archives.concordia.ca. Retrieved 2016-03-30. ^ "Maureen Forrester". www.concordia.ca. Retrieved August 17, 2017. ^ Canadian Who's Who 2003, books.google.com.au; accessed June 23, 2015. ^ "Maureen Forrester biography". Governor General's Performing Arts Awards Foundation. Retrieved February 2, 2015. ^ Canada's Walk of Fame: Maureen Forrester Archived 2006-10-30 at the Wayback Machine, canadaswalkoffame.com; accessed June 23, 2015.